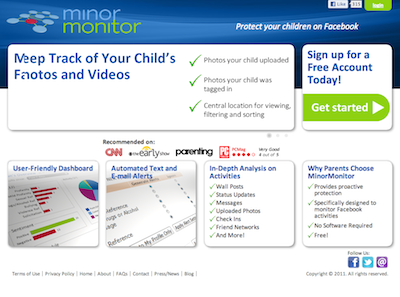 MinorMonitor is a free service that enables parents to monitor their child’s Facebook activities and friends. Via an intuitive dashboard or email, parents can access a snapshot and detailed analysis of potential dangerous activities such as bullying, hate crimes, drug use and sexual references. MinorMonitor is a consumer product of Infoglide Software, which is the technology behind the US Dept of Homeland Security Screening program. MinorMonitor gives a parent an easy view into their children’s Facebook activities and friends, through knowledge-based analytics. Via an intuitive dashboard view, parents can access either a snapshot, or full detail and specifics, of potential dangerous activities. The online tool enables parents to get a quick “dashboard view” of their children’s Facebook activities and friends. MinorMonitor analyzes wall posts, photos, videos, messages and other Facebook content to alert parents about cyberbullying, drug use, sexual references and other undesirable activity. MinorMonitor is a free web-based tool that gives a parent a quick, easy view into their child(ren)’s Facebook activities and friends, through knowledge-based analytics. Via an intuitive dashboard view, parents can access either a snapshot, or full detail and specifics, of potential dangerous activities such as bullying, hate crimes, drug use and sexual references. MinorMonitor was created by Austin-based Infoglide, a government-grade technology company that has, for over 15 years, been delivering behavior and reputation information to federal government and Fortune 500 companies focused on fighting frauds. Infoglide is the technology behind the US Department of Homeland Security’s TSA screening program. Infoglide executives developed MinorMonitor to leverage the company’s deep security and fraud analytics, and extend them as a service to benefit parents growing increasingly concerned over ensuring their child(ren)’s Facebook activities are safe.